In the parable of the sower, Jesus tackles one of our greatest hopes and one of our greatest fears. We hope that our lives will take root in good soil, that we will be fruitful and productive people. And we fear—at least many of us do—becoming shallow, and failing to hang on in the long run. Is anyone so steady or so sure as to feel there's no risk of falling away, or of a mid-life crisis that makes us prey to the birds that devour the seed of faith? Many years ago I was at Mass in a convent chapel with a wonderful Sister, still very active at 92 years of age. When the intercessions came, she prayed "Lord, grant us the grace to persevere." At 92, she still lived each day by the grace of God, knowing the race isn't over till it's over. A fruitful life, a life rooted in the teachings of Christ, isn't something we want only for ourselves; if we have children we both hope and fear for their future; if we have grandchildren it is much the same. Will those youngsters who received their First Holy Communion stay close to the Lord they welcomed so eagerly? Will the gifts of the Holy Spirit at Confirmation lead them to be true disciples amid all the temptations of the world? A pastor, too, worries about the good seed being snatched from the hearts of his parishioners, young and old. Even the prophet Isaiah [Is 49:4] and St. Paul himself [Phil 2:16] admit to being afraid that their work was all for nothing. It's not hard to be a little pessimistic when we see so many young people turning aside from their Catholic upbringing—or even when we see in ourselves more weeds and thorns than abundant grain. The scorching sun of work and worry beats down on many of us, leaving us barely enough time or energy for the spiritual life. And when we do make a little progress in prayer or scripture reading, or just when we've finally managed to make it regularly to Mass, our team makes it into the finals, or an elderly parent needs care, or there's a tough assignment at work. The good seed we'd planted is snatched away. What's the answer to this timeless predicament, one that seems particularly tough in our times? We find an answer from Isaiah, the very same prophet who said "I have labored to no purpose; I have spent my strength in vain and for nothing." [Is 49:4, NIV] Because no sooner did he says those words than he added: "Yet surely my cause is with the Lord, and my reward is with my God." In other words, Isaiah confronts his fear of the future with the virtues of faith and hope. And that's exactly what we must do: we will persevere in our own struggles, and pray properly for those we love, only with faith and hope in God's promises. One of those promises comes to us from Isaiah himself, in today's first reading. It's a good deal cheerier than today's Gospel, and the two really need to be read together. Isaiah's prophecy uses an example we all know. The rain and snow that falls on the earth eventually returns to the skies. Water evaporates and returns to the atmosphere—after it has given life to dry soil. The cycle may be interrupted by flood and drought, but otherwise it is continuous and unfailing. God's word—that word that the Letter to the Hebrews calls "alive and active, sharper than a double-edged sword"—is also unfailing. The truths taught to our young people, the truths we ourselves have learned from the Christ, never become sterile seeds; they will bear the rich harvest of abundant life if we will cooperate even minimally with God. Not much room there for pessimism or for too much fear of those birds. Still, how do we reconcile the clear warning we've heard—and the failures we've seen and experienced—with the promises we're made and the hope we are meant to have? One answer is given by the Lutheran theologian and martyr Dietrich Bonhoeffer, who warned against what he called "cheap grace." Cheap grace is grace that costs us nothing, that invites no disciplined response, and not even the least sacrifice. It's an utter contradiction, since something won at the price of Christ's blood cannot be cheap. Even though God has freely poured out his grace on us, we must still treasure and respect it. Though we can't earn it, we can and must respond to it. What does that response require? As I did last week, I'd like to offer a "take-out," or as they say in some places, a "take-away" homily. You'll find it on the second of the two cards I printed as souvenirs of my ordination anniversary, which I hope you'll pick up after Mass. The card is headed "Holiness," and it quotes Pope Benedict. The Holy Father states the essentials of a holy life in very few words—proving, I'd say, that we can live fruitful lives without heroics and that overcoming the rocks and thorns of life isn't too much for any of us. 1. Never let a Sunday go by without meeting Christ in the Eucharist. 2. Begin and end each day with at least a brief contact with God in prayer. 3. Follow the Ten Commandments, the "signposts" of Christian life. Pope Benedict says that "this is the true simplicity and greatness of a life of holiness." Nothing more than Sunday Mass, daily prayer, and making all our decisions according to the law of love. 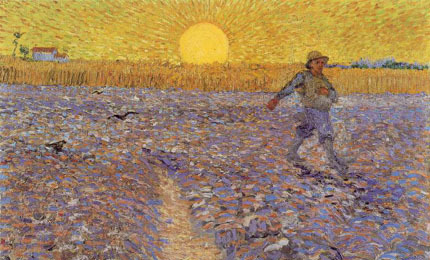 That word will not return empty to God the Sower; it will not leave us hungering for the Bread of Life, but will accomplish all God wants—if we respond to Him in the very simplest of ways. The essential means never leaving a Sunday without an encounter with the Risen Christ in the Eucharist; this is not an additional burden but is light for the whole week. It means never beginning and never ending a day without at least a brief contact with God. And, on the path of our life it means following the “signposts” that God has communicated to us in the Ten Commandments, interpreted with Christ, which are merely the explanation of what love is in specific situations. It seems to me that this is the true simplicity and greatness of a life of holiness: the encounter with the Risen One on Sunday; contact with God at the beginning and at the end of the day; following, in decisions, the “signposts” that God has communicated to us, which are but forms of charity.